When will the liberal media stop treating left-wing ideology as a proxy for intelligence? The basis for the media’s unfair attacks on Bush’s intelligence is his 30-year-old Yale College transcript (purloined last fall and published by The New Yorker). Yet The Washington Post‘s subsequent revelation of Gore’s unimpressive academic record has done little to alter the media’s false portrayal of Gore as “the smartest kid in the class.” It is a record that is worth reviewing, if only to debunk the myth of Gore as a serious student. Gore’s undergraduate transcript from Harvard is riddled with poor marks, including a C-minus in introductory economics, a D in one science course, and a C-plus in another. Gore’s graduate school record — consistently glossed over by the press — is nothing short of shameful. In 1971, Gore enrolled in Vanderbilt Divinity School where, according to Bill Turque, author of “Inventing Al Gore,” he received F’s in five of the eight classes he took over the course of three semesters. Not surprisingly, Gore did not receive a degree from the divinity school. Nor did Gore graduate from Vanderbilt Law School, where he enrolled for a brief time and received his fair share of C’s. (Bush went on to earn an MBA from Harvard). Two pages later, readers will be shocked – shocked! 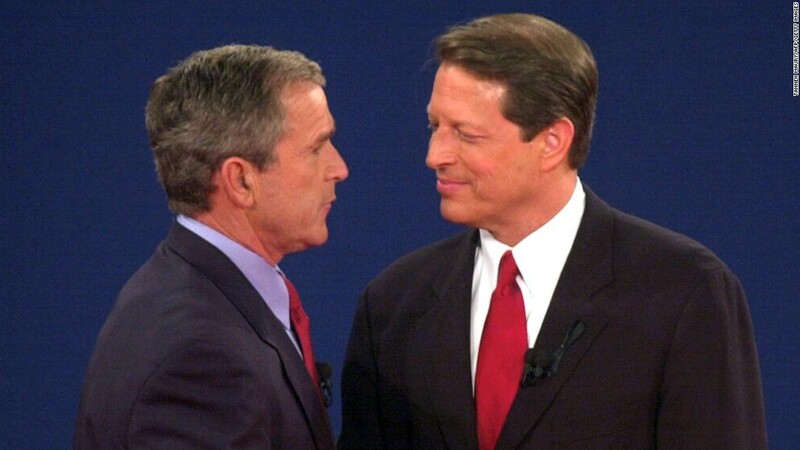 – to learn that the magazine’s (no doubt scientific) study of the candidates’ facial gestures reveals that Gore is the “more serious, constrained, controlled, weighty, ponderous, (and) dominant of the two candidates.” More ponderous, perhaps… but, please, spare me the pop psychology. Poor Al, he’s just too smart for the job. Of course, the stereotyping of conservative candidates as dumb and liberal candidates as “brilliant” is nothing new. Had resourceful journalists investigated, they might have learned (as we now know from Stevenson’s biographer John Bartlow Martin) that Harvard Law School Dean Erwin Griswold had hidden Stevenson’s transcript in a locked cabinet in his office. Stevenson, the so-called “thinking man’s candidate,” had, in fact, flunked out of Harvard Law. In the end, neither intellect nor academic performance is an especially important criterion by which to judge our presidents. Ronald Reagan and Harry Truman were no scholars, but they rank among the best presidents in our country’s history. This election is not an I.Q. test; it is about which candidate has better judgment. And that is why, despite the media’s love affair with the celluloid image of Al Gore the policy-wonk, it is the affable, authentic, and sensible Bush who would make the better leader. Originally published in the September 7, 2000 print edition of The Boston Globe.